We have, in the past, done reviews about some height gain books similar to this guide. Seeing this grow taller guide, I was captivated by the statement, “unique secrets you won’t find anywhere else” mentioned about this guide in the e-commerce website on Amazon, where the book “How to Grow Taller” was found. This is really interesting and it seems it may be a real deal for achieving appreciable height. However, the author states that by using the secret methods therein, we would achieve growth up to 4 inches added to our height in 2 months. Is that really possible, or is the author just throwing claims out there? Well, this review will have the full details. Read down to see the information we all would want to know! What Is How To Grow Taller” Guide? As I’m looking at the product’s page, it seems like this is a 93-page book written by Monica Heart, which promotes that it contains the “master secrets” to achieve an increase in height in a natural way. The book, How To Grow Taller” claims it will show us the unknown secret exercises to achieve the height we want without any unwanted effects. According to the author, she had several professional and social setbacks because of her short stature. This is not an uncommon scenario. But her curiosity and painstaking research brought a solution to her short stature, according to her, which is the program we are about to grab. By using the routine in the book “How to Grow Taller” she gains an additional 4.5 inches in height within the period of practicing the routine. The author mentions revealing the same secret routine that gave her the improvement in height in this guide. However, I could not find any statement about approval or recommendations of the book by a healthcare professional(s), yet the author states that the methods contained are 100% natural, easy and safe to carry out. Keep on with this review to see more details about the guide “How to Grow Taller”! How Does How To Grow Taller” Guide Achieve Results? Firstly, the author shares that the How To Grow Taller book is an illustration of the different secret workout we would do to gain permanent height. The guide should be effective depending on the user’s time and commitment to carry out the steps as illustrated in the book. A brief preview of peripheral information in the book was mentioned meaning we would only have full access to the whole so-called secret by purchasing it. It seems the growth techniques would have an effect on the HGH levels as this was mentioned in the table of content. Additionally, an increase in height will also be achieved using the guide by conditioning ourselves to the hypnotic section as implied in the author’s description. There should be no prescription portion to carry out the guide as this is no pills or drugs which may cause unwanted effects. Who Can Use the Book How to Grow Taller”? In a case where you are neglected and have missed opportunities because of short stature, the author of the guide “How to Grow Taller” claims that the book is for you. Similarly, the author’s description implies that the Grow Taller Book is for individuals who have lost their self-confidence due to the effect of their short stature. Yet, there is no age limit stated by the author as to the usage of this guide, but we would not conclude whether it has an after effect on one’s health without using the methods; though the author stated there are no side effects. The book did not mention anything about a clinical/medical endorsement of the methods. 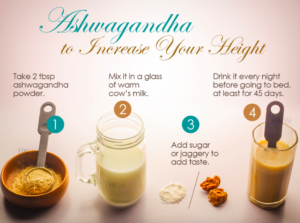 Let us see further details about this height gain method! 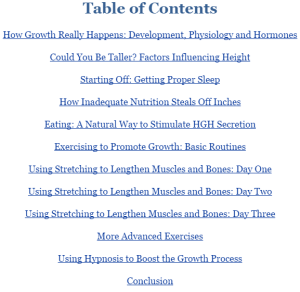 Therefore, incorporated in this grow taller guide according to the author’s preview includes the processes of growth, factors that influence growth, an effect of sleep on height, the effect of nutrition, and natural approach to stimulating HGH secretion. Plus, basic exercises to promote growth, stretching exercise, other advanced exercises for growth and hypnosis to facilitate the growth process. The author of the book How To Grow Taller”does not offer much customer user’s support and I assume the aim is to get people buying the book but the claims have not been authenticated by medical professionals. Evidently, it was stated in the e-commerce website where it was found that it works “effectively” and has achieved good results. Yet, feedbacks were not seen by customer users of the method. The author’s description implied that by giving the required time and commitment to the illustrations in the book, we will achieve effective results as regards height gain in a safe and a completely natural manner. Claims of “4′ inches in 2 months”, seems unreal and misleading claims to me. Evidently, Heart has portrayed the details about the book How to Grow Taller” stating the benefits it will achieve. Similarly, there was no review and/or feedback seen about the book. This is to differentiate the real methods from those marketed unscrupulously by vendors on several internet directories. 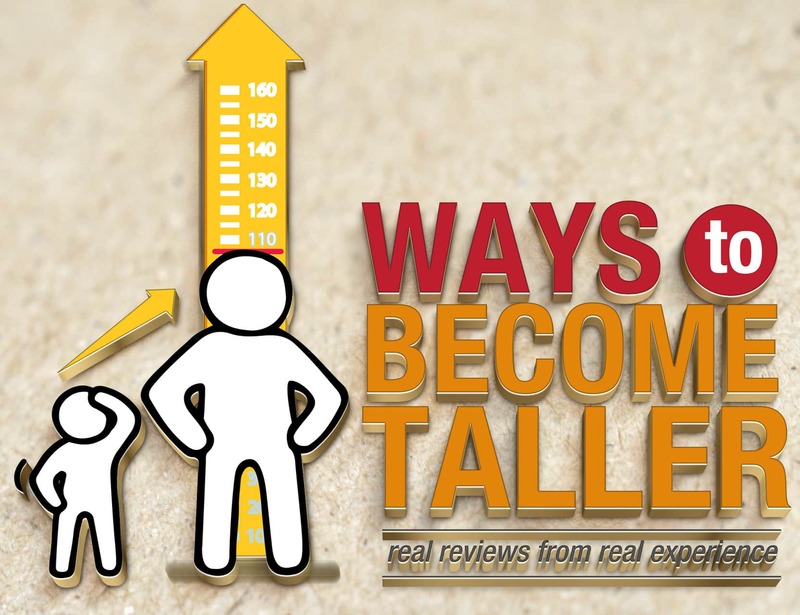 My painstaking research and investigations confirmed that details stated about the guide, “How to Grow Taller” are no drugs or pills even though there were no clinical and/or scientific proofs to back up the claims. Here is what I have to say about this height gain book. Claiming that this guide will achieve an increase in height very fast, could be misleading because if the illustration will affect the normal height process, it cannot be a gain-height-fast program. And again, there is nothing found for any type of proof of evidence to back up any of her claims, from my research here. 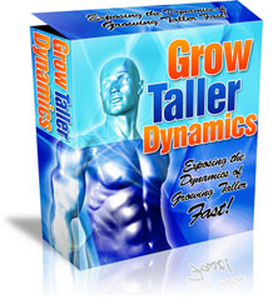 Perhaps, why not give you a hand here and show you something that we as users can expect to increase our height, by using a program called (Grow Taller Dynamics guide). With this height increasing program, I was actually able to find several proofs of videos, such as proven results from a previous user, see review here! 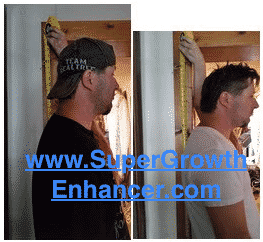 Now on my review, I share everything we need to know, regarding this height enhancement program by Dr. Miller. Click here to visit the review! If somehow you have any further questions and needs more clarifications, don’t forget to leave your comments below or contact me. I would be more than welcome to help! Hi Power (Height Increase) Capsules & Big Big Caps (Height Increase) – Is It a Scam? Vita Growth Height Increaser – Review – Is There Any Reviews From User’s Results? Well, I don’t know about 6″ full inches more, but a few you definitely can benefit from using something very effective and completely safe to increase height. 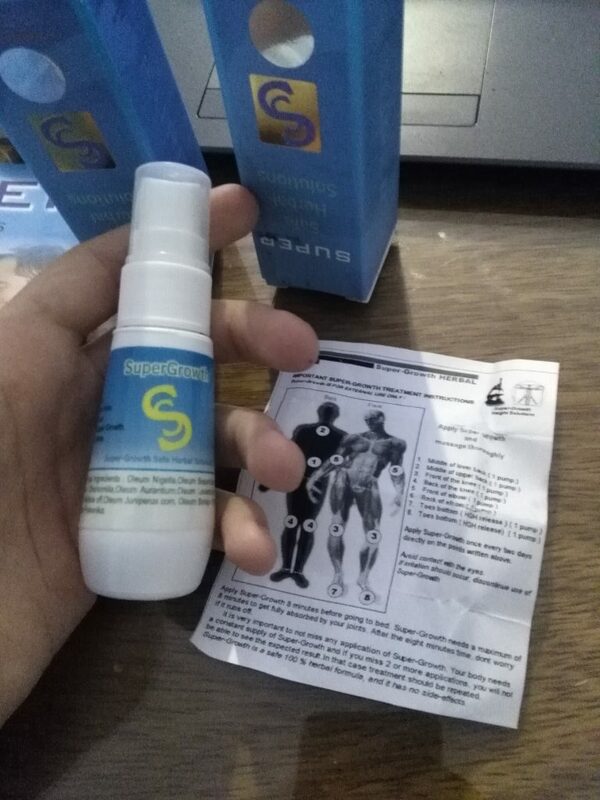 Now regards to “medicine” as you mentioned, have you got a chance to take a look at the Growth Factor Plus w/ Somatroppinne or the Super-Growth spray formula? Either one should give you some results in height growth. 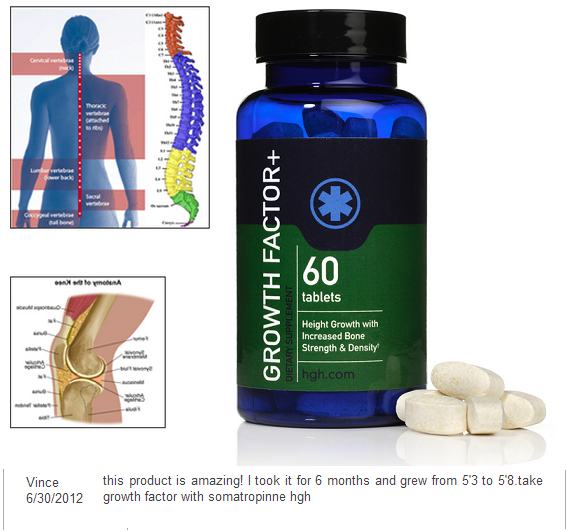 The perfect solution for you, would the Growth Factor Plus pills w/ Super Growth spray formula, plus with following the procedures, such as stretching exercises in the daily basis, have more nutritional foods in your diet, sleep 8-10 hours per night, have a positive patient mind to expect these growth, and by using the Growth Factor Plus w/ Super Growth, you can expect to really achieve those growth of 5-6 inches after minimum 6-12 months, without causing any side effects whatsoever. That’s just my honest opinion and advice here. hi my name is khushi and i am 21 year old bt my height is only 4. inch suggest me any pills there is no side effects plz tell me…….. I actually wrote back to you on the other review regarding the Growth Factor Plus pills w/ Somatroppinne for you to take and expect to increase your height. Since you’re only 21 years old, take a look at my review (click here) about the Growth Factor Plus and from there, you can check out the reviews from real consumers to share their results with no negative side effects from taking these effective and safe pills.